Man …this global warming is cold ! I know its crazy , with all the warming going on I have gone through more firewood in the last 3 months than I would have normally gone through in 3 winters ! 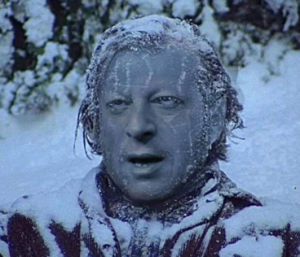 Jeeze … can we just trash the whole global warming thing , I know Al is going to be sad if we do , because he did invent global warming , or was it the internet , I don’t know. Either way after the last polar vortex and blizzards with sub zero temperatures across the country … I think it’s time…we come up with a new name. Oh I know , some are calling it “Extreme Weather ” , well that fits , but this isn’t the X games here , were talking devastation on a global scale, California is in Extreme Drought right now , in a state of emergency …and its only February … just think what August is going to look like . Apocalypse How: The Snow That Wouldn’t Melt ! The Snow The Wouldn’t Melt ! What … the hell… snow that doesn’t melt , snow that turns black and smells like plastic when heated ! It all started yesterday January 29th after much of the United States was blanketed by a winter storm that pushed snow fall into the southern regions of the country , places that don’t normally get snow all that often…unusual yes. Videos have started coming in from all around the country of people trying to melt the snow that fell yesterday using lighters and blow torches… I know it’s crazy. 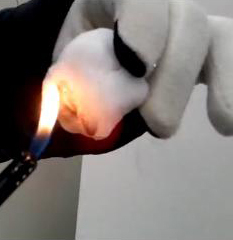 In some cases with using only a small bic lighter the snow does not melt at all and in some cases starts to blacken , as if something in the snow was burning , in fact people are reporting that it smells like plastic… yuck ! When blow torches are applied to the snow , it seems to just evaporate slowly with no melting what so ever, very strange indeed. Although it’s probably just the normal effect of a flame on snow , I don’t know , no snow around here to test but it makes for great diversion on a snowy Thursday afternoon.